While this post is uncharacteristic of me and this blog, baby fever has taken over my life. My Facebook feed is overrun with babies these days, and in real life it’s time for my first close friend to have a child. My very best friend in Israel Beth is due any day (hour?! minute?!) now and so a few weeks ago I had the fun of planning my first baby shower. I needed baby shower food ideas, and as usual Pinterest came to the rescue. This watermelon baby carriage was perfect because not only does it look cute and create an interactive centerpiece, but since Beth has gestational diabetes it also fit my sugar-free rule. Yup, the whole baby shower was outfitted with snacks made entirely (ok, mostly) with natural sugars. As impressive as this watermelon baby carriage looks, it was a cinch to make (and this coming from someone who wouldn’t call herself crafty). All you need is a watermelon, a good sharp knife and a metal spoon and you’re in business. Then fill it with your favorite fruit salad, toss some orange slice wheels on the side, and you’ve got a baby buggy watermelon. If you're looking for baby shower food ideas, this watermelon baby carriage makes a fun edible centerpiece and is easy to make! Cut a very thin slice from the widest, ugliest part of the watermelon so it sits flat on the table. Using a large, sharp knife cut out one quarter of the watermelon (slice down halfway through and across halfway through, and remove the wedge). 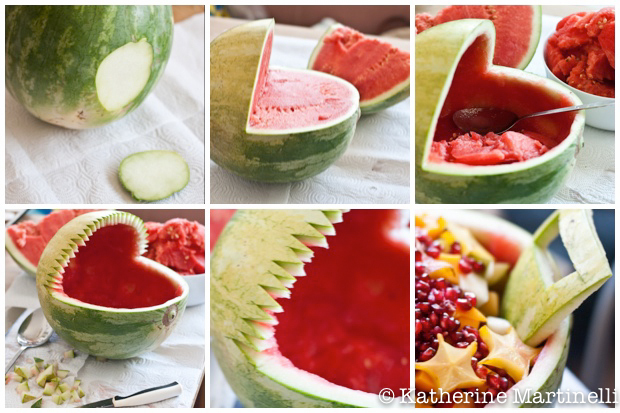 You can slice the watermelon from the removed wedge to include in the fruit salad later. Using a metal spoon, scoop the watermelon flesh out into a large bowl. Reserve for another use (I made watermelon-lime aqua frescas). It should pretty much look like a baby carriage at this point. For some extra decoration, cut out little triangles with a paring knife in the top edge of the watermelon carriage to create a zig-zag trim. Attach the watermelon slices with toothpicks to make wheels. You can carve a stroller handle from the removed watermelon wedge. Scrape away the watermelon flesh and cut the wedge in half. Trim the wedge lengthwise a bit, then carefully cut out a rectangular opening by the top. Insert it into front of the baby carriage so it sticks out slightly. 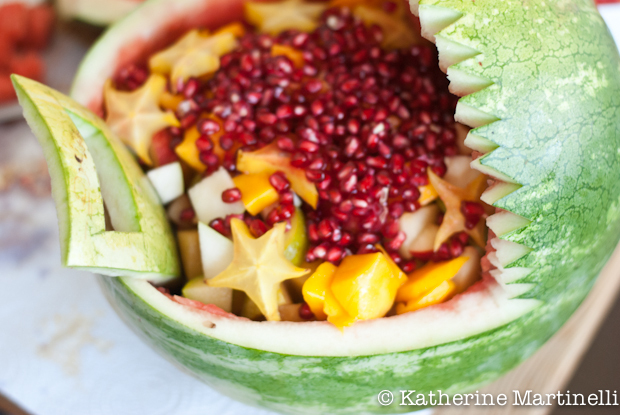 Spoon your favorite fruit salad into the baby carriage and serve. 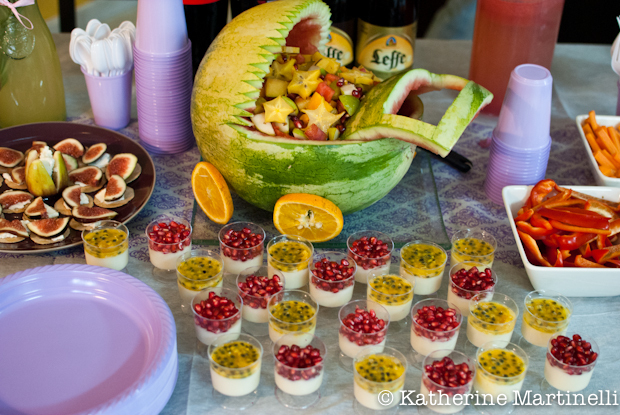 The full spread – watermelon baby carriage, malabi (Middle Eastern milk pudding), cheese and fig crostini, sparkling rosemary lemonade, watermelon-lime aqua fresca, and more! A little too girly for me! 😉 Actually it’s pretty clever. And I could see how you could adapt the basic concept to all sorts of events. For a football tailgate cut the watermelon into the shape of a helmet. Summer beach picnic? Clam shell. And so on. Really nice idea. Haha honestly it’s a little too girly for me too – but I have to admit I had fun making it. Love your ideas for converting into something more versatile. Super cute idea, Pinterest to the rescue again! Wow. This is a work of art. Pinterest is the most amazing ever. I am constantly astounded by the creative and innovative ideas I find there. Well done on your first baby shower. Katherine that is super cute and so creative. I love Pinterest for that stuff! How fun is this! Love the watermelon baby carriage as well as all of the other treats. What a spread! The watermelon carriage is so adorable and easy to make. thanks for sharing this inspiration. pinned! what a brilliant idea and you executed it with such perfection! This is so cute Katherine! This is one of the most unique baby shower food item ideas I’ve seen, and I like that this is so healthy as well. Love it! old rehashed material. Excellent read! I’ve saved your site and I’m including your RSS feeds to my Google account.